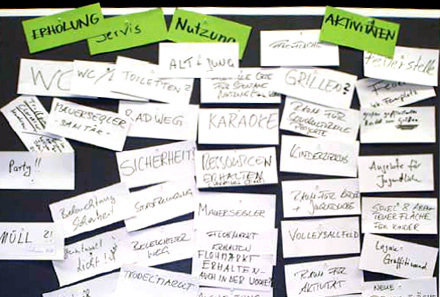 On September 15, 2010, the 32 nominated members of the new “Bürgerwerkstatt” (“Citizens’ Working Group”) for the completion of Mauerpark met for their first session at Olof Palme Center. The series of workshops, moderated by the professional mediation team of Seebauer and Voskamp, would be a forum for the active and collaborative planning and design of the new green space, and would be moderated by the professional. Right away, a lively and creative atmosphere became evident, with many exciting, sometimes controversial ideas about the further development of Mauerpark. On November 2, 2010, the Mauerpark Bürgerwerkstatt presented its provisional conclusions to the public. In addition to the presentation of the key topics and goals, there was also a wide public discussion. Through this discussion, it became clear that the majority of the Bürgerwerkstatt stood strongly opposed to or rejected outright the choice of construction sites in the 1-64 building plan, because it would be a continuation into Wedding of the profit-oriented construction that had already brought so much gentrification to Prenzlauer Berg, and would destroy the structure of the recreational space that had developed so well in Mauerpark. 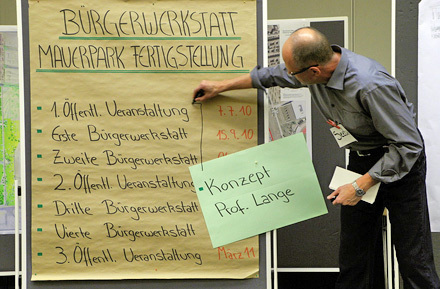 The participants in the Bürgerwerkstatt cannot support massive construction. The Bürgerwerkstatt wants a lively, large Park, which is incompatible with the proposed developments. The Bürgerwerkstatt’s fight for the completion of an enlarged Mauerpark goes on. It is always seeking to find new ways to plan and bring about the completion of Mauerpark in collaboration with more stakeholders, without letting the Senate forget about its own responsibilities. The planning of the green space, based on the design by Prof. Lange, has come a long way. Together with Grün Berlin and Prof. Lange, the Bürgerwerkstatt will continue to work toward a plan to bring about space that meets the needs of residents on both sides of the park. Such a blueprint of the completion of Mauerpark can then provide the basis for public debates and political decisions.